It’s likely your tasting schedule for the Epcot International Food and Wine Festival is already jam-packed with sampling some of the hundreds of items on sale at the booths around Future World and World Showcase, but if you’re looking for a slower-paced, more educational dining experience, look no further than the festival’s special events. Though the slate of available events changes from year to year, a few staples, including the Mexican Tequila Lunch, have stuck around the last few years, proving popular options that are both educational and entertaining. 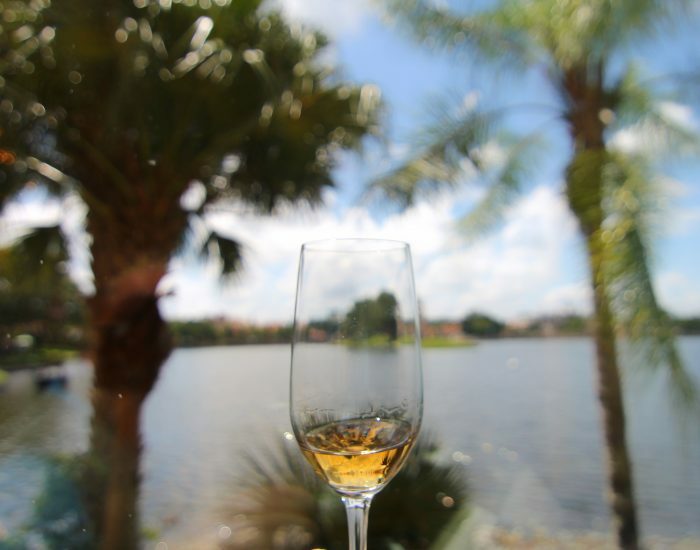 The Mexican Tequila Lunch features excellent food, drinks, and views. This year, I’ll be reviewing two such popular events that run throughout the festival season. 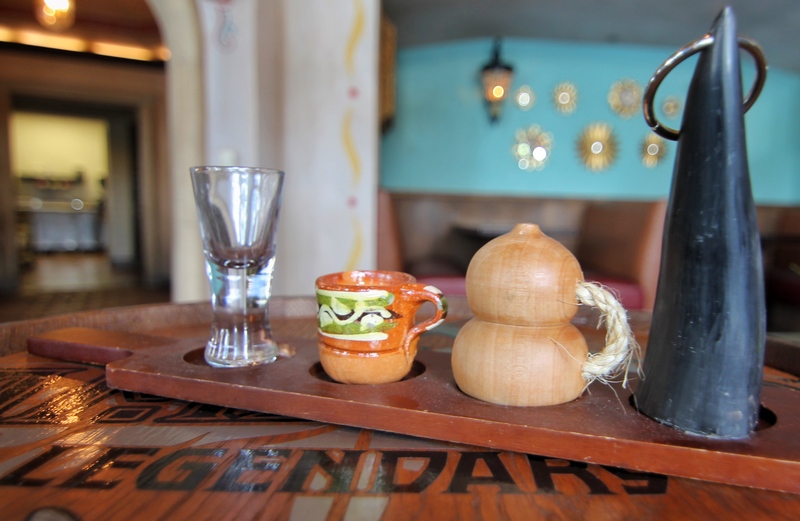 First up: the Mexican Tequila Lunch, held select Wednesdays, Thursdays, and Fridays throughout the festival season from noon to 1:30 PM at La Hacienda de San Angel in Epcot’s Mexico pavilion. 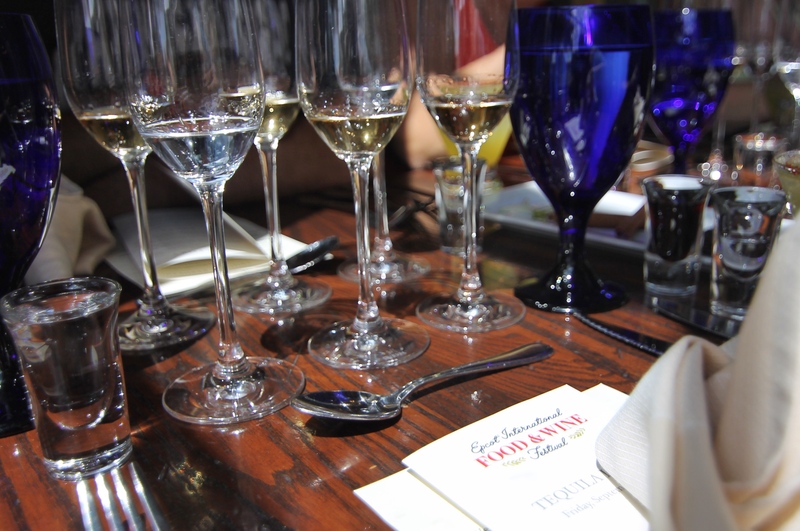 Hosted by the tequila experts from La Cava del Tequila, this $85 event includes a four-course Mexican-inspired meal as well as tastings of several tequila varieties. 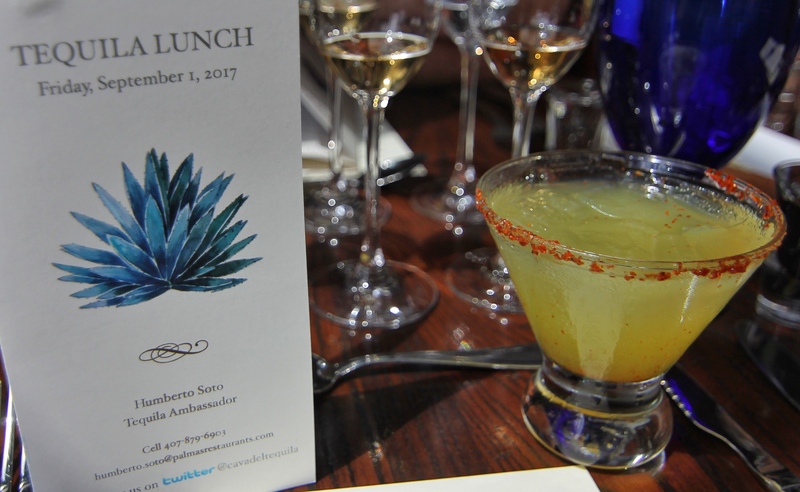 I attended the first tequila lunch held during the 2017 festival season, and here, I’ll try to give you a sense of all the great information, food, and of course, spirits, I got to sample during the meal. Check-in takes place just outside La Hacienda, after which Cast Members welcome guests into the restaurant with a warm greeting and an ice-cold margarita just before seating us in assigned areas of the dining room. Honestly, as soon as I sat down, I was overwhelmed at the sheer amount of liquor in front of me. I had been concerned that $85 was a bit steep for a lunch, even featuring alcohol, but upon looking at the table setup and the menu in front of me, I was very, very excited to see what the meal had in store. I sampled my welcome drink, a silky smooth, slightly sweet Tequila Avion cucumber margarita, as the remainder of the guests settled in around me, and soon, we were off to the races. Humberto Soto, resident tequila ambassador and our host for the afternoon’s meal, welcomed us and then started explaining a bit about the course of events that was about to unfold. Essentially, we would be learning how to taste tequila in a proper way, learn a bit about how tequila is made, and then alternate sampling and pairing various varieties of tequila alongside each course of the meal. Each guest was provided with a brief pamphlet explaining a few of the intricacies of agave (the plant from which tequila is distilled), as well as a few of the basics of the different kinds of tequila we would be sampling. To start, Humberto taught us the secrets of proper tequila tasting. This is a far more complicated process than I had imagined, and takes a bit of practice to really get down pat. First, you take a deep breath in, and take a small sip of the tequila whilst holding your breath. Then, you swish the tequila side-to-side, then front and back on your tongue, and then swallow. Finally, you swirl the tip of your tongue around your mouth before taking another breath. This sounds like a lot for one sip of tequila, I’ll admit, but you get used to the pattern after a bit. This process really does help you to taste the tequila’s true flavor profile without any perceived burn, and it brings the aftertaste of the spirit to the very front of your tongue. Throughout the meal, we also smelled each of the tequilas with various foods on the table; we learned that blanco pairs well with fresh lime zest, the reposado with a broken cinnamon stick and lime zest, and the añejo with coffee beans and a cinnamon stick rubbed together to bring out the scent. This activity was simple but very effective in teaching the pivotal flavor notes of each kind of tequila that we should note while tasting them. 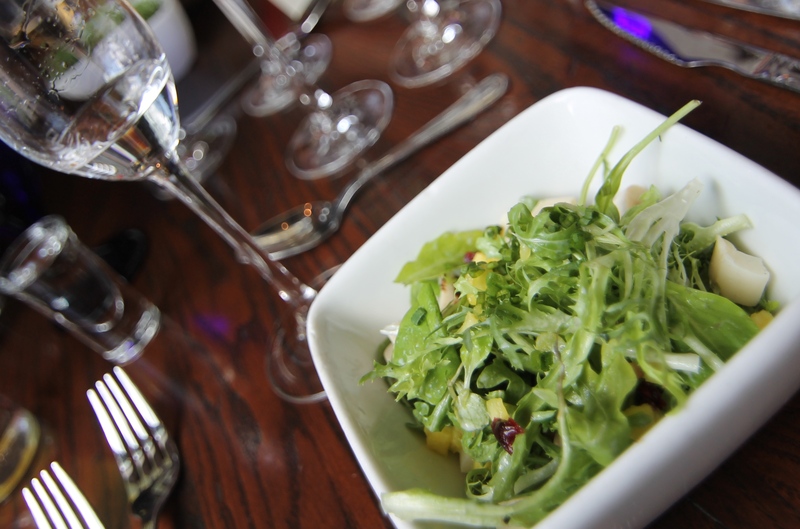 Paired alongside the tequila are four food courses (with a revised menu from previous years’ events), starting with a heart of palm salad with mache lettuce, baby arugula, roasted pineapple, pine nuts, and a Mezcal vinaigrette. The salad was light and peppery, with a kick of sweet from the roasted pineapple. Paired with the young tequila blanco, a very light sip itself, the salad was a small, refreshing starter for the palate. 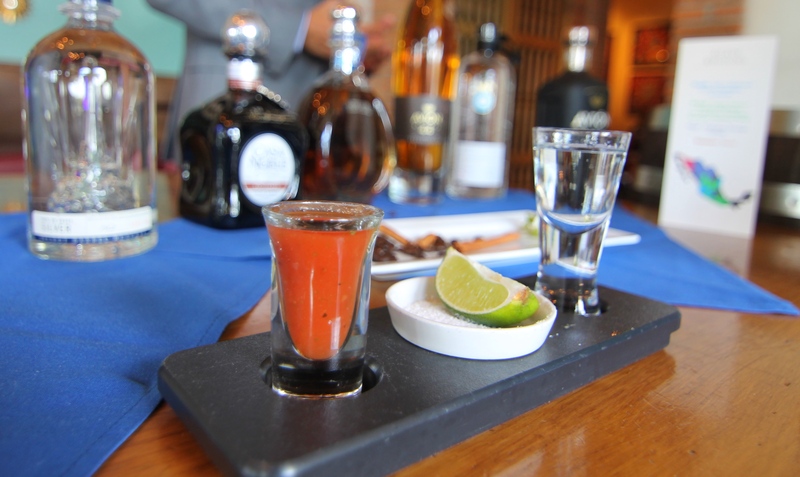 Next, we sampled the slightly longer-aged reposada tequila, a bit fruitier and fragrant in spices alongside grilled octopus, marinated in ancho and served on a black mole sauce, butternut squash puree, and grilled cactus leaves. 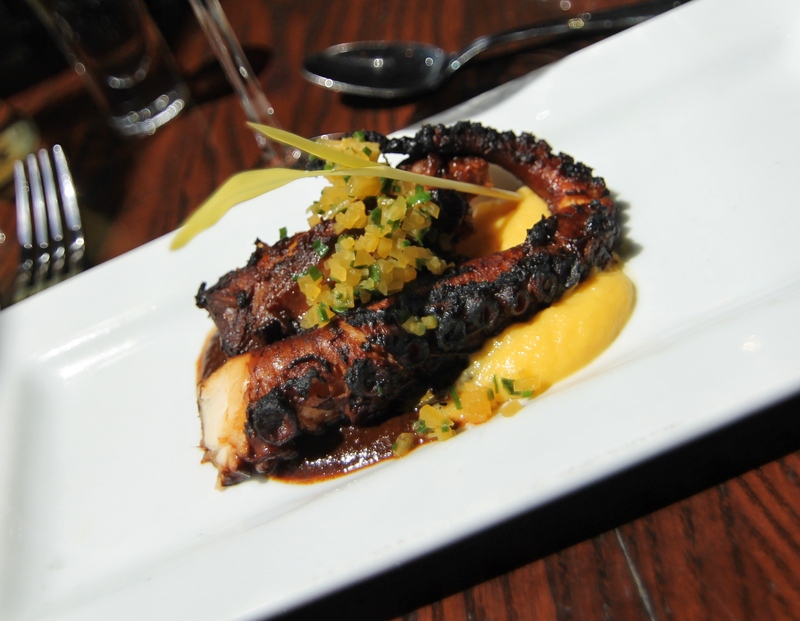 The vanilla and cinnamon notes of the reposada balanced perfectly with the sweet butternut squash puree and spicy (flavorful, not heat) mole, and the expertly prepared octopus contrasted with the mild, crunchy cactus leaves to create a wholly satisfying appetizer course. 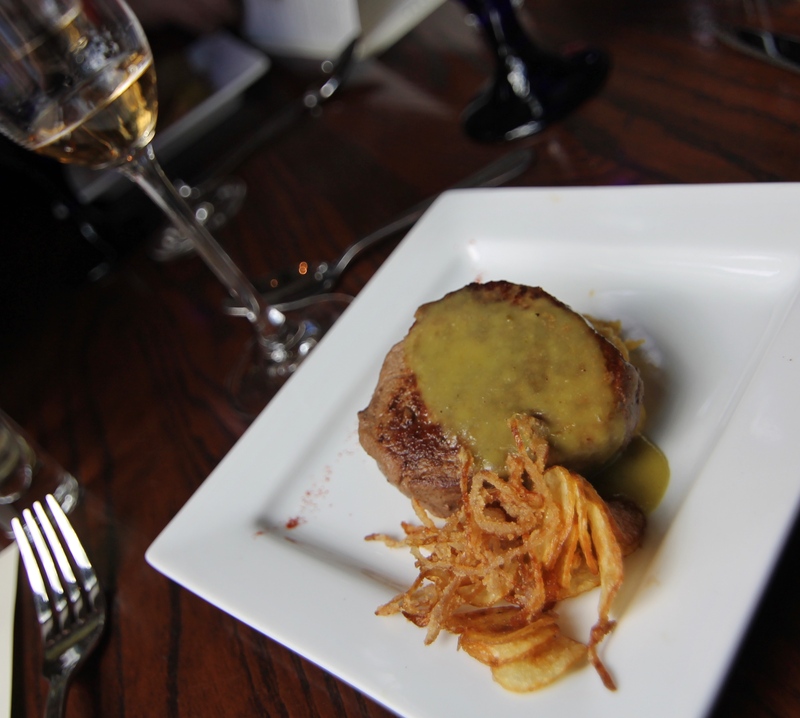 Our main course, a three-to-four ounce portion of fork-tender beef tenderloin topped with poblano cream sauce, plantain puree, and fingerling potato chips, matched with the rich, deep flavor of the tequila añejo. The coffee and chocolate notes of the aged tequila brought out the earthiness in the plantains and potatoes, and stood up to the strong flavor of the steak just fine. Following this course, we took a break from tequila to taste a bit of mezcal, distilled from the center of the agave plant (as opposed to using the whole blue agave plant, as tequila does). Incredibly smoky in flavor profile, followed by a very fruity finish, this tasting was akin to sipping a smooth bourbon after tasting a lot of whiskey varieties. It was a lovely contrast to the tequila tastings we’d previously had with each course, and really shows how slight changes in the plant used to distill the spirit could make such a huge flavor difference. 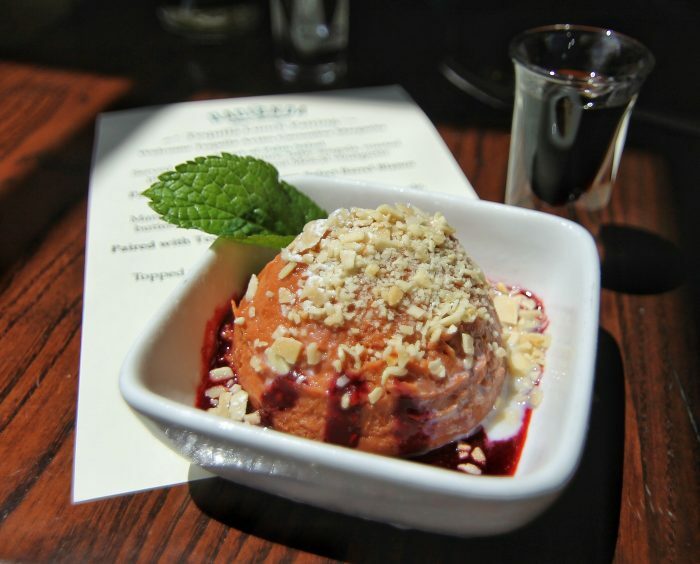 Finally, we sampled an espresso tequila liqueur alongside dessert, a mamey flan with blackberry coulis and almond dust. Mamey is a fruit native to Central and South America that looks a bit like a large mango on the outside, and a papaya on the inside. It’s very sweet and creamy, super rich and perfect for dessert applications like this pudding. I wasn’t overly fond of the texture of the dessert, but the flavor definitely paired well with the fun “coffee” course, the bitey espresso tequila liqueur. Overall, lunch ran about an hour and a half, and included so much tasty tequila and food that I felt no need to sample any Food and Wine booths after departing. Along with enjoying a great meal, I learned a ton from Humberto and the accompanying pamphlets we received about how tequila is made, each type of tequila, and how to properly taste and compare tequilas. For the price, this lunch was a great value and so worth trying – I would certainly recommend you try to book one of the last meals before the end of this year’s Food and Wine Festival (which you can do by calling (407) 939-3378). I know I can’t wait to attend again in a future year. 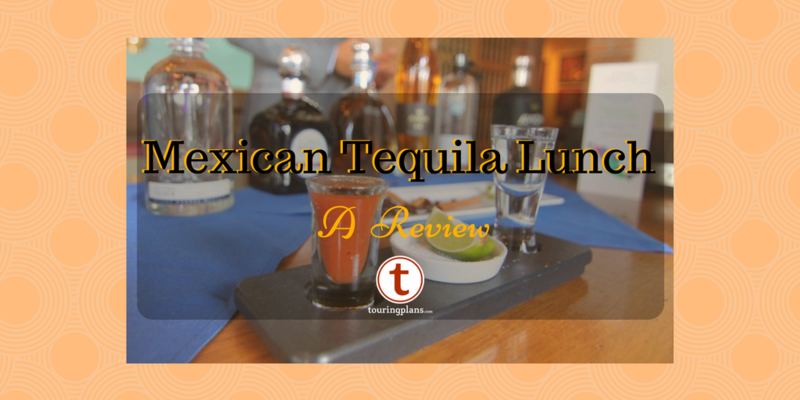 I also attended the first Tequila Lunch on August 31st. I agree that Humberto was wonderful and we did taste many Tequilas, and learned a great deal. My only concern was the food. The Octopus was chewy, the beef was rare and Flan was more like sweet potato paste, unlike traditional Flan. I wish they had not changed the menu from previous years. Overall, I did enjoy the Tequila and the information that was shared, but did not enjoy the food served. Would still recommend it for the knowledge that is gained from the presentation.